The second Norfolk (DL-1) projected as hunter-killer ship (CLK-1) was laid down 1 September 1949 by the New York Shipbuilding Corp. Camden. N.J. launched 29 Deeember 1951; sponsored by Miss Betty King Duckworth; and eommissioned 4 March 1 953 Capt. Clarenee Matheson Bowley in command. The first major U.S. warship built since World War II Norfolk was authorised in 1947 as an anti-submarine hunter killer ship which could operate under all weather conditions and would carry the latest radar sonar and other electronic devices. As a large destroyer leader designed on a light cruiser hull she could earry a greater variety of detection gear than a destroyer. After her Caribbean shakedown cruise (February 1954) Norfolk was assigned to the Atlantic Fleet and between 1955 and 1957 served successively as flagship for Commander Destroyer Flotillas 2 4 and 6. During 1956 and 1957 she acted as flagship for Commander Destroyer Force Atlantic Fleet. In June 1957 Norfolk participated in the International Fleet Review as flagship for Admiral Jerauld Wright Commander-in-Chief Atlantic Fleet and Supreme Allied Commander Atlantic. By 1959 Norfolk's 8 3" 70 cal. guns had been replaced by 8 3" 50 cal. guns and her 20mm. battery had been removed. In 1960 the addition of an ASROC launcher enchaneed her antisubmarine capabilities. On 10 May 1960 an 83-foot Cuban vessel harassed Norfolk while she was patrolling the Florida Straits with The Sullivans (DD-537) in international waters. 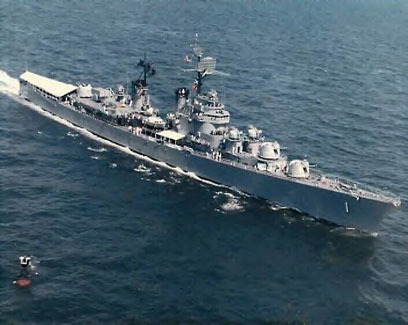 In Fall 1961 she took part in UNITAS II as flagship for Commander Cruiser Destroyer Flotilla 2. During the operation she performed ASW training exercises with the navies of Venezuela Colombia, Ecuador, Peru, Chile, Argentina, Uruguay, and Brazil. Norfolk repeated this cruise over the next five years during which she served as flagship of Commander South Atlantie Forees except in 1962 when she was flagship for Commander Cruiser Destroyer Forces Atlantic Fleet. Norfolk joined LANTFLEX 66 as flagship between 28 November and 16 Deeember 1966. During this exercise she was shadowed by the Russian trawlers Repiter and Teodilit. She proved her antisubmarine capabilities again as flagship for Comma nder South Atlantie Forces during UNITAS VIII in Fall 1967. Norfolk was assigned to Commander Middle East Forees as flagship (17 April-15 October 1968). On this mission she visited Bahrain French Somaliland Saudi Arabia Ethiopia. Kenya the Seychelles, Mauritius, Malagasy Republio, India, Pakistan, Australia, New Zealand, Tahiti, Mexico, and Panama Canal Zone. In Ootober 1968 Norfolk returned to Norfolk where she decommissioned 15 January 1970 and entered the Atlantio Reserve Fleet.